My favorite gifts to give family members are ones that are homemade and personalized. Last year I wanted to start a tradition of giving the Grandmas a different homemade ornament with a picture of my sons on it. This is the first one I did (I hope they don’t expect them to get more elaborate each year). 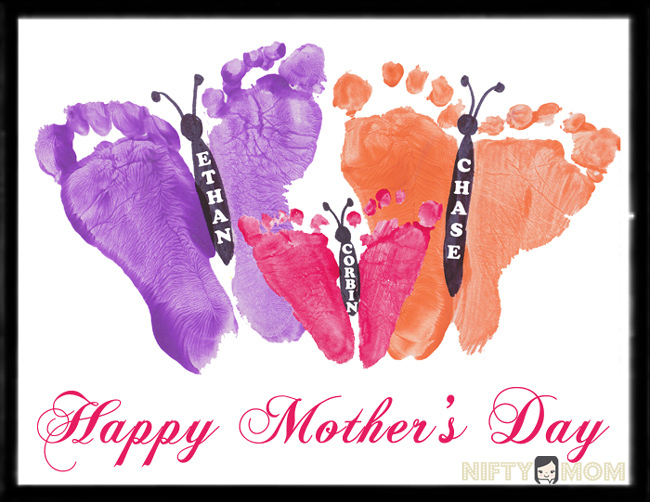 Unfortunately, Nifty Mom was non-existent last year so it never crossed my mind to take step-by-step pictures. It was a little more difficult than I would have liked it to be, but it was worth it. Cut two pieces of ribbon a few inches long and glue them side-by-side in the middle of the back of one picture. Glue the other picture on top of the ribbon. Place under a heavy book to hold the two together for a few minutes to allow the glue to dry completely. Detach the metal top of the ornament and temporarily remove the wire loop attachment. Pull the ribbon from attached to the pictures up through the holes on the metal top piece (the holes on mine were too small, so I used a screw to widen them). Replace the wire attachment. 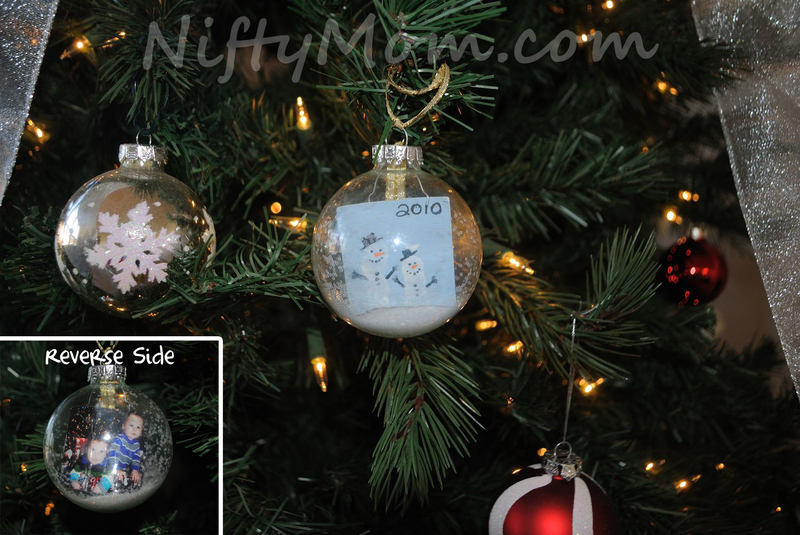 (this is the most difficult part) Roll the picture vertically and put it into the ornament. Once in, I used a pen to stick in there and flatten the picture out as best as possible. Using a paper funnel, pour some white glitter in ornament. Adjust the two ribbons on the top of the ornament so the picture is center and tie. Cut the extra off and put a small amount of super glue over the knot to secure. Add an ornament hook or ribbon on the loop to hang. Please let me know if you have any questions! I hope yours comes out even better than mine did! If you are looking for something cute to do with your toddlers or kids for Mother’s Day, this is easy and there are so many things you can do with it! Use pink or red finger paint for the ‘flower’ and paint a stem/grass (this was the best I got out from my 22 month old). I always use card stock instead of copy paper, because it is thicker and shouldn’t warp from the paint. I always take a picture of the artwork and upload it on my computer. Then not only is it forever saved, but you can use it to print copies, make photo gifts (mug, shirt, mouse pad, etc), or use it in a photo book. 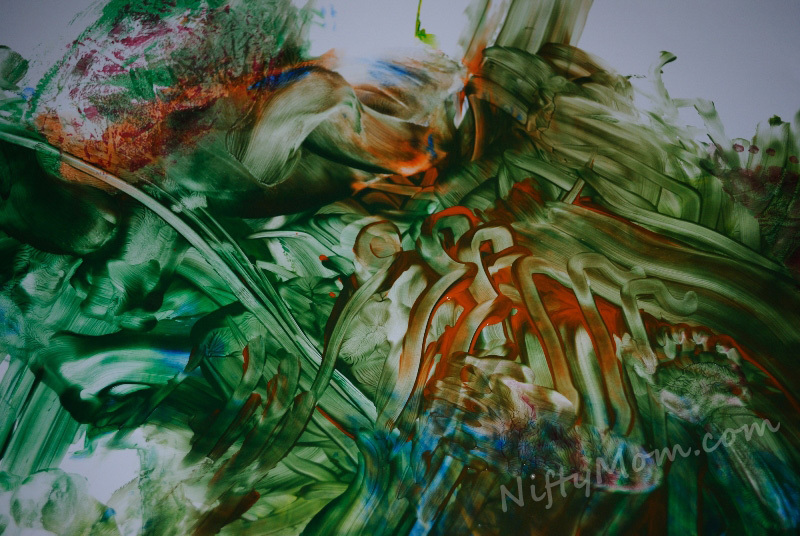 ***Click here for another finger paint gift I did with my son. 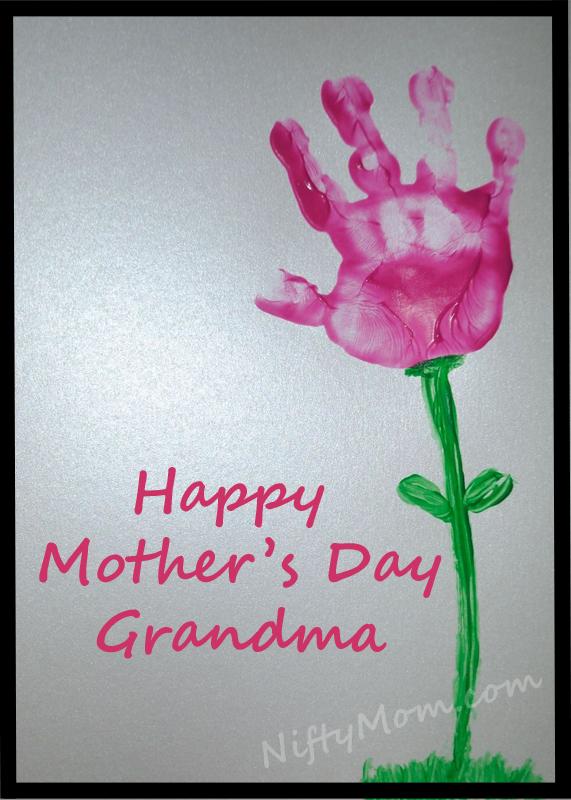 ***Or you can make a Handprint Sun or Footprint Butterflies. 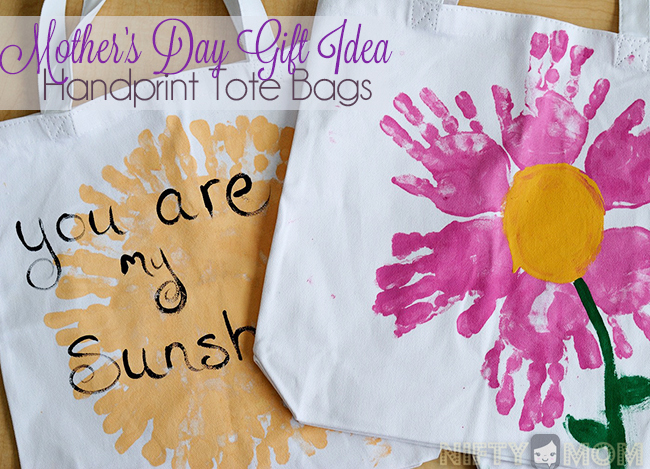 UPDATE: Check out the Handprint Tote Bags we made! I came up with this idea for a gift for my husband last Fathers Day. Our son was 11 months old at the time and I decided it was time for him to do his first artwork and finger paint. It was so much fun and so easy to do! 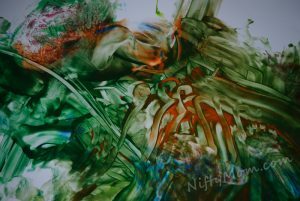 I draped the sheet over a table so it was a background and covered the floor area. 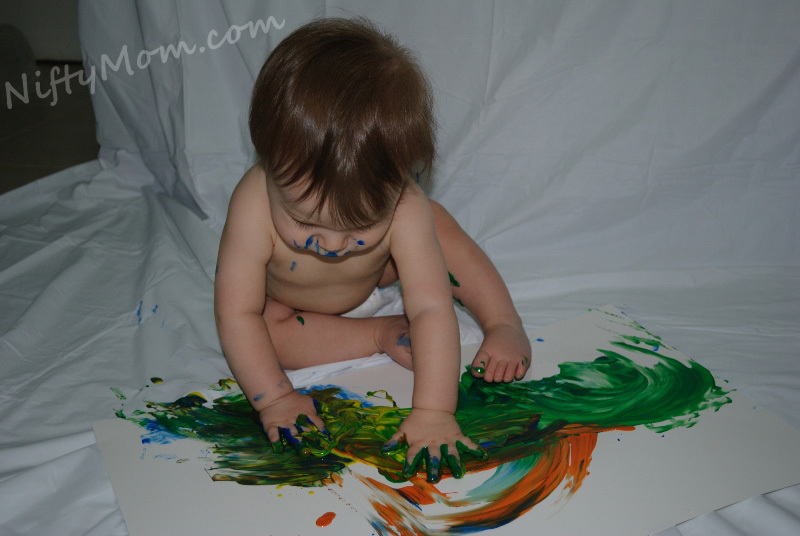 I put down one paint color at a time and let him paint. And after it was all done, I was very happy with his artwork! It was perfect to use as a picture mat. *Nifty Tip: Take a picture of the finished artwork. This way you can use it as a digital background or just have a copy of it. I picked my favorite section and cut out the size of the frame I was using. 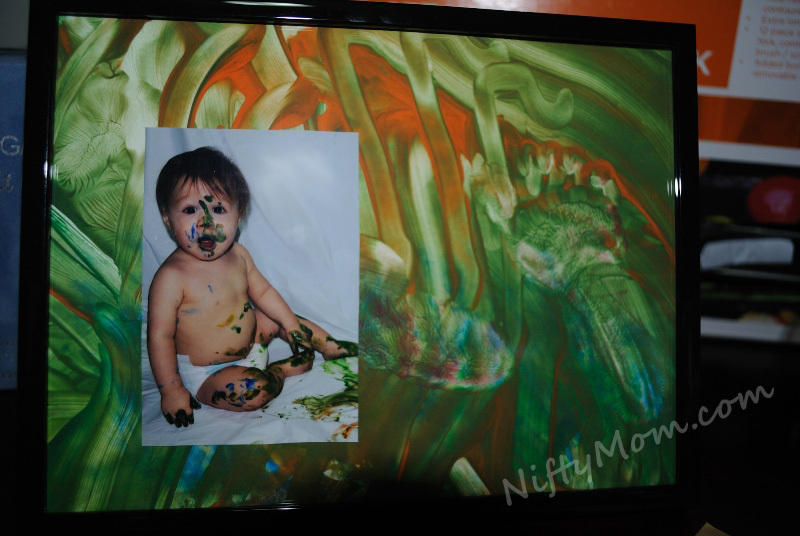 *Nifty Tip: Take the frame (with the backing and inserts removed) and hold it over the artwork to see what it will look like before you start cutting. 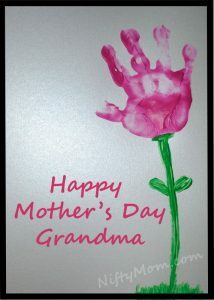 ***See the hand print flower I did with my son for more ideas.